With a crazy Wakarusa Music Festival showing just still echoing in our heads, party blues keyboardist Andy Frasco made his way around some nearby cities for Wakarusa Pre-Party Tour with support from veteran percussionist Mike Dillon, along with his Band of Outsiders, and up and coming, instrumental “jazztronica” trio Mouth. All three of these bands played Wakarusa this year, but Frasco, who was at the helm of the Waka Pre-Party Tour MC’d the main stage as well. Before they got up to Mulberry Mountain, however, their stops included Nashville, Memphis, St. Louis, Lawrence, Kansas City, Bloomington and Columbia. The Memphis stop went down at the 1884 Lounge in Minglewood Plaza on a rainy Wednesday night. But nothing, weather included, could hold back any of these bands. 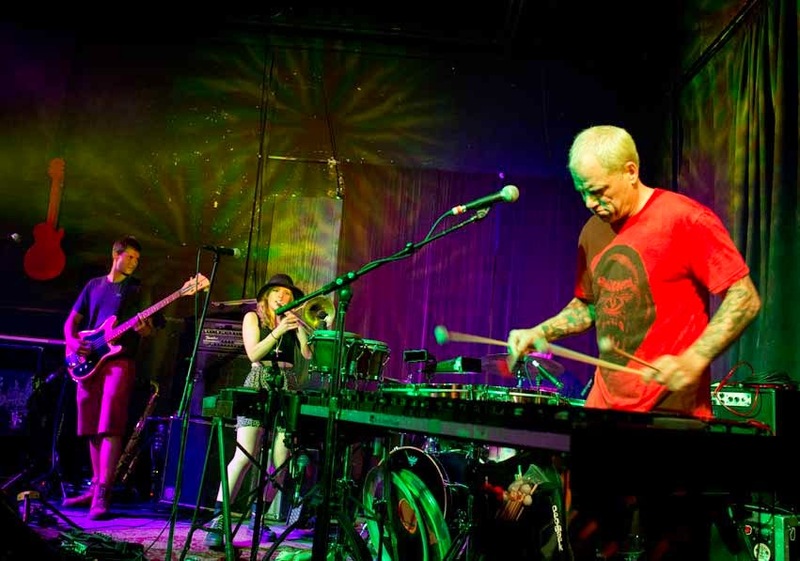 Mike Dillon’s Band of Outsiders stepped up next and barraged the stage with a massive wave of percussive, tribal jazz. The rather unique instrumentation of the group consisted of drums, bass, percussion and trombone. All members of the band are adeptly in tune with each other, however, producing an incredible energy flying back and forth across the stage. 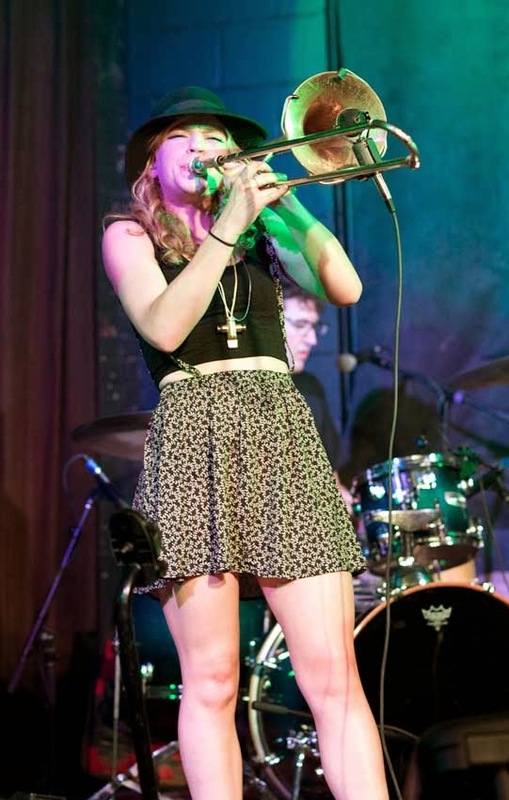 The Band of Outsiders led the audience through a timeless lesson in jazz, ranging from bebop and swing to New Orleans funk. Somewhere inside this talented group of musicians, however, there exists an urge to release some punk rock. Thrown in between percussion-based jazz tunes, these punk rock tracks would break in with raw emotion. 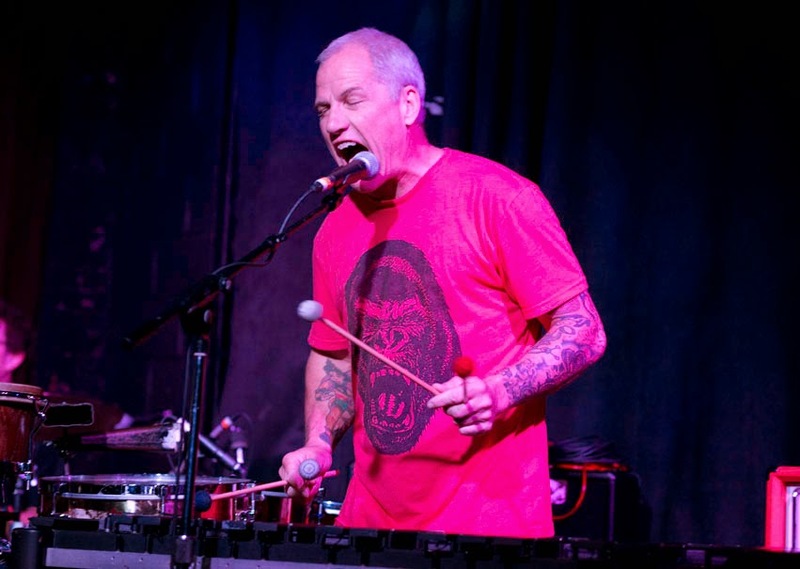 Finally, while Mike Dillon is a monster on all of the percussion instruments he plays, his true talent shines through on the vibraphone. Playing primarily with two mallets in each hand, Dillon works the vibes like a puppet master, deftly controlling each and every note. His creativity and sense of humor also come out in his use of what looks like an empty coffee can, which he rubs his shirt against to form a squeaky percussion instrument. Andy Frasco & The UN took the stage next to end the night with a powerful performance. Frasco’s backing band is called The UN because the lineup changes regularly. 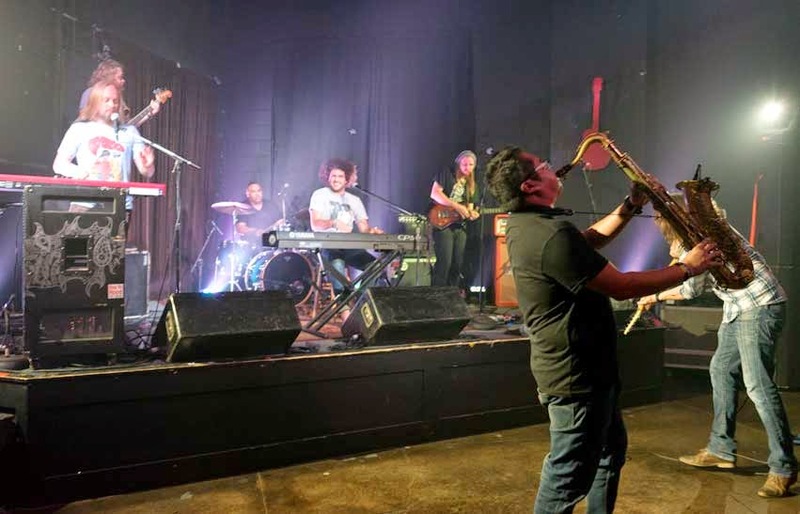 For this tour, The UN consisted of two of his regulars, Ernie Chang (saxophone) and Shawn Eckels (guitar), along with a few members of the Kris Lager Band from Nebraska (including Kris himself on guitar). Lager and his band have helped Frasco with some of his studio work, and they seem to have similar views on music and stage performance. 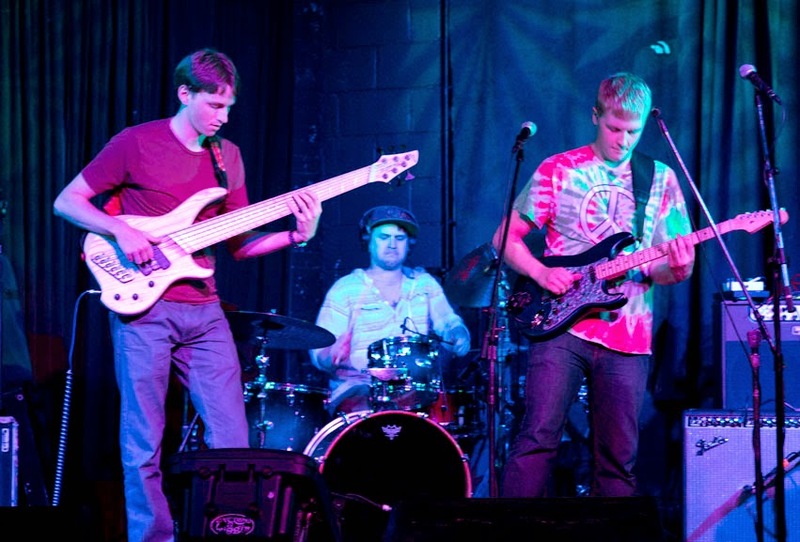 The combination provided for a lineup consisting of two guitars, two keyboardists, saxophone, bass and drums. I have said things like, “You’d be hard pressed to find a band that has more fun on stage” about a few other bands before, but you can quote me on this: There is NOBODY that has more fun on stage than Andy Frasco. I have seen him play twice before, and no matter how big or small the audience, Frasco consistently brings an energy to the stage unmatched by anyone in the music business. With his primary musical influences coming from blues greats such as Buddy Guy, Frasco’s songwriting covers multiple classic genres, such as gospel, blues, R&B and rock & roll, while putting his own unique, modern spin (as well as his quirky and sometimes raunchy sense of humor) to it all. At this particular show, Frasco & The UN led an excited audience through a mix of old and new originals, as well as some great covers, including a rockin’ interpretation of (You Gotta) Fight For Your Right (To Party!) by the Beastie Boys, in which more than one member of The UN climbed up on top of whatever they could find to get the crowd moving. One of Frasco’s signature live stunts involves the members of The UN getting off the stage and into the crowd to battle each other in the midst of the audience. This show was no exception. The audience experienced many musical battles, including a “Battle Royale,” in which Frasco brought the trombone player from Mike Dillon’s Band of Outsiders back into the frenzy, and the keyboardist of Frasco’s UN even brought his keys into the audience with a stool for support. Frasco is also a great band leader. While his fellow band members are taking solos, he can be seen on stage directing his band with accents and drum hits, keeping the groove going constantly. Ragin’ Randy: I was looking at your tour schedule, and it is absolutely wild. What drives you to schedule yourself on such a hectic tour? Andy Frasco: My goal is to entertain as many people as I can. If it takes going around the country and going around the world for 10 months without a break, then so be it. RR: So you guys just got back from China and Europe. Can you tell me a little bit about that experience? Frasco: Yeah, we just got back from Macau, and then we went to ten cities in Germany and nine cities in the Netherlands. It’s amazing how universal music is because they don’t speak your language, but they still have fun because everyone’s going nuts and freaking out. RR: Can you tell me a little bit about the new album you have coming out? Frasco: Yeah, it’s called Half a Man. I got funding to start my own record label, and this will be the first release. We got Charles Gooden, who got a Grammy for Supernatural by Santana and also did a couple of Beck albums and some Rolling Stones, to produce the album, and it’s the best work I’ve done. I feel that I’m in a different mindset on this album. I’m not just putting out an album to make money on the road. I got to sit back, take my time and write good lyrics and try to write something that emulates our live show but still has that old, timeless feel that good albums have.